Today, I will introducing you to my first Lip cream ever. I got this from Collection Event few months ago. I fell in love at the first sight with the color when the first time I swatched it during the event. Luckily I got the exact color that I want inside my goody bag~ hehehehe. Collection Cream Puff Lip Cream enriched with an ultra moisturising, vitamin-rich formula. The creamy colour hugs lips to give your pout the perfect powdery finish. Velvety soft and matte-finish lip cream. Cotton Candy, Fairy Cake, Powder Puff, and Angel Delight. All the names are very cute and beautiful for me hehehehe. My shade is Cotton Candy. It is a mixed between milky pink and red color for me. The texture is creamy, glides on easily on my lips and has a pigmented color. It provides matte finish without overdrying my lips. It is quite moisturising for me, so I can use it alone without my lipbalm under it. But, sometimes when I'm having a super dry lips, I prefer to apply lipbalm before to makes my lips more soft and moist. Staying power is okay~ It stayed longer than normal lipstick. But, sure the color will fade when I eat heavy food. What do you think about the color? 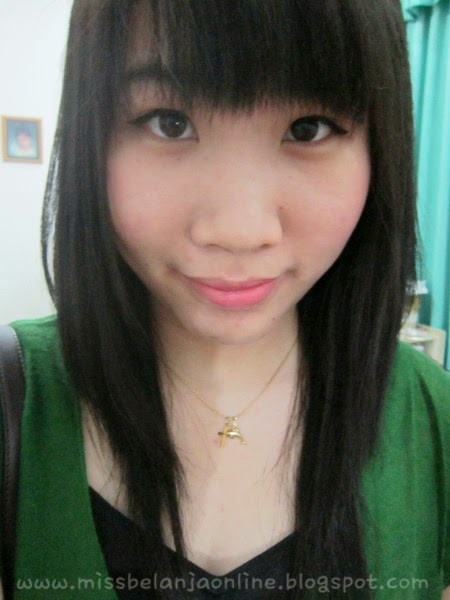 This one is my favourite color~ Later when I can, I want to buy the other colours too~ hehehe. Yah, nggak bisa beli deh ._. The names are so fluffy! Heh. The color is really nice too! ohhh!! that lip color is so pretty!! it looks so gorgeous on you! love it!